I had a plan for my post today. I was going to continue the series about living with Adult ADHD, but as I was writing the post it felt forced and I don't want to post something that's not ready, so instead...how about some wine and love? As always, the lovely Nora is hosting, so head over there and see what she (and others) have to say! *Getting a phone call from my mom last night inviting me to girls night with her and my aunt who's in town. We laughed, we talked, we drank, and had a wonderful time. (I also might have written some of this post when I was a wee bit tipsy). *The Hills. Oh my gosh that show is horrible and wonderful all at once...and all of the seasons are on instant netflix. (Don't judge, you know you love it). I don't know what's better - the hilarious nothing-ness that's said, or the fact that the mister refers to Spencer as "flesh beard." How are you this Thursday? Do you indulge in any ridiculous reality TV shows? 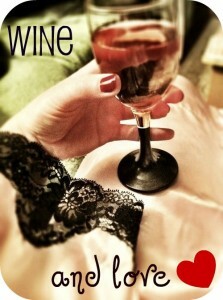 What's your wine and love today? Ooohhh - can't wait to hear the recipes. I've been trying to mix it up more since we are diligently trying to eat out less. I can seind you some, too! Even though I feel great having the test behind me, this was not my best week for various reasons. But oh well! It's almost over! Yeah, not sleeping is the worst. I am still adjusting to the new digs, the new bed, listening for children at night and etc. so I've not been sleeping well. I hate it! I have been sleeping EXTREMELY well and deeply this week (according to sleep cycle on my iPhone anyways) kind of weird but I'll take it! Not sleeping is the absolute worst! I've been watching a whole lot of Saving Grace on Netflix lately. It's the guilty pleasure that I don't feel guilty about. Oh, gosh, not being able to sleep is horrible. I dealt with bad insomnia when I was 12 so I can definitely sympathize. I hope your sleeping habits return to normal soon! have you tried writing things out before bed? clears the head very very well. great job on the cooking! the scones looked delicious.